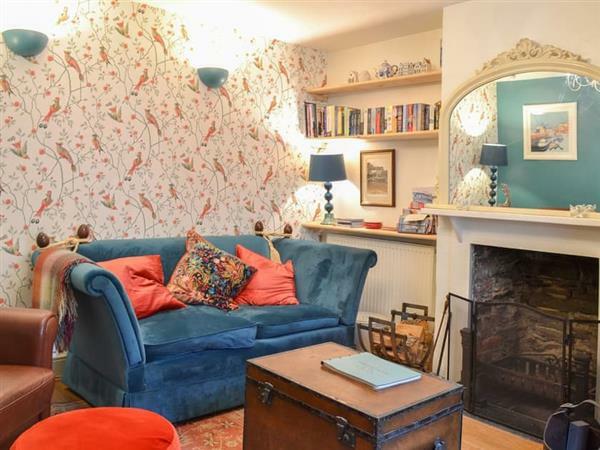 Sage Cottage in St Columb Major, Cornwall sleeps 4 people. Sage Cottage in St Columb Major is a grade II listed cottage, which is set on a quiet lane in the centre of St Columb Major; once the historic capital of Cornwall, this is a little gem and the perfect spot to relax, or use as a touring base for the whole of Cornwall. This semi-detached property is within St Columb Major, which is pretty much in the centre of Cornwall, but it is only a couple of miles to some of the North coast’s amazing beaches, including Watergate Bay, home of Jamie Oliver’s restaurant and the National Kitesurfing Centre. There is also 1-mile of golden, sandy beach with excellent surfing, and a great surf and hire centre, as well as a local pub and beach bar serving great local food and ales. Just minutes up the coast and you arrive at Mawgan Porth Beach, with great surfing, sand, stunning views and walks along the South West Coastal Path, there is also a great restaurant and deli, and a beach shop that provides all you need for that quintessential beach day. Heading still further along the coast, past quiet and secluded little coves and bays, you will arrive at Padstow, renowned for the food of Rick Stein. But Padstow is so much more, from Michelin starred restaurants to great Cornish pasty shops that line the working harbour, enjoy a pasty or ice cream, or even both while you watch the fishing boats unload the days catch. Padstow sits at the mouth of the Camel Estuary where the Camel Trail starts to wind its way inland. This flat multi-use trail is perfect for cycling, walking or horse riding, and hugs the banks of the river as it flows inland to Wadebridge, a pretty market town that spans the river. Newquay, with its 11 beaches, is also close by and a must for the bustling town offers plenty for all, from a zoo to a cinema, and places to dine whilst watching the waves crash in against the beaches. St Columb Major also enjoys the fact that it’s close to Newquay Airport, so why not fly down and leave the car at home, or when you are here you can book a flight to the wonderful Scilly Isles way off Lands’ End. The Eden Project, St Ives, Fowey and Port Isaac all great days out and all easily reached from St Columb Major making Sage Cottage a must for those wanting to see and experience this wonderful county. There is a beach 6 miles from Sage Cottage in St Columb Major. With the shop 85 yards, and the pub & restaurant are 65 yards from Sage Cottage. Living room: With open fire, 40 Smart TV, Blu-ray player and wooden floor. Kitchen/dining room: Farmhouse style with electric cooker, microwave, fridge, beams and slate floor. Gas central heating, electricity, bed linen, towels and Wi-Fi included. Initial fuel for open fire included. Small courtyard with patio and garden furniture. No smoking. Please note: Couples and family bookings only. No children under 12 years old, except babies under 2 years old. Holidays at Sage Cottage run from Saturday to Saturday. For a better idea of where Sage Cottage is, you can see Sage Cottage on the map below. Sage Cottage is in Cornwall; should you be on the lookout for a special offer, you can find all the special offers in Cornwall. It's always worth checking to see what is on offer at the moment. Do you want to holiday near Sage Cottage (UK10410), you can see other cottages within 25 miles of Sage Cottage; have a look to find your perfect holiday location.